It's almost time for Independence Day! Just a couple of short weeks, and it will be here. I'm starting to get my house decorated (come by tomorrow to find out how). If you're looking for a few fun ways to get your house or your family in a patriotic mood today, look no further! 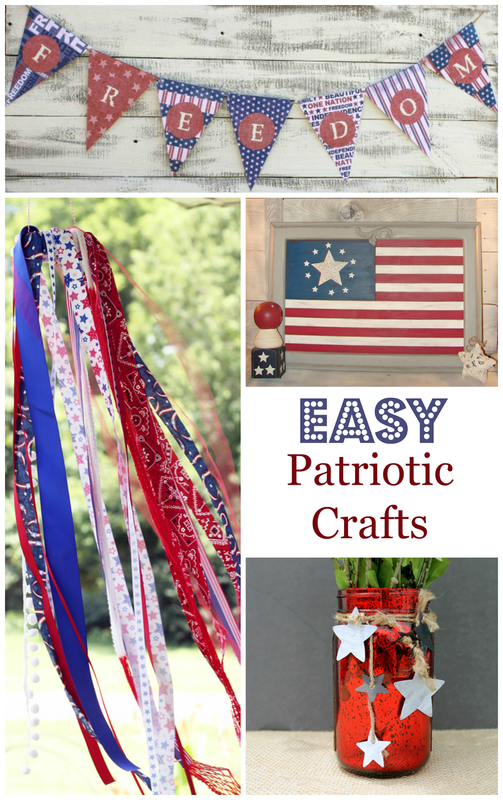 Patriotic Mason Jars from Consumer Crafts look like an easy way to brighten up the house - they would look great as a vase or holding candles outside while you're waiting for fireworks! If you like vintage, Olives and Okra have a sweet little patriotic bunting that's sure to catch your eye! Muchmore Creative had a cabinet door that was in need of an upcycle, so she made it into a flag wall hanging - really! The Country Chic Cottage made a cool patriotic wind sock. I'm loving that this is a kid friendly project; we may be making something similar around here very soon! !